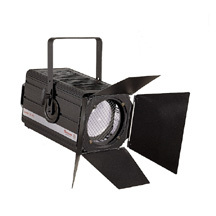 It is the simplest form of spotlight with lamp and reflector which together move backwards and forwards in relation to a fixed Plano-Convex lens giving control of the beam size. As in the Fresnel model, the beam is adjustable, though more concentrated. More often called a PC spot, the plano-side of the lens is most commonly pebbled but can be clear on request.